The principles behind the WOCU have been vetted, analysed and approved by a wide group of Economists and Market Participants. The apolitical WOCU basket of constituent currencies comprises those of the current top 20 countries by Gross Domestic Product (GDP), as determined by the International Monetary Fund (IMF). Each country’s individual currency (the Euro is duplicated for Germany, France, Italy, Spain & Netherlands) is elegantly weighted based upon the relative importance of its GDP. These relative weightings are adjusted biannually, based on published IMF World Economic Outlook (WEO) figures of changing GDP values. The importance of a WOCU member country changes with its economic growth or contraction: by its weighting being adjusted or its currency being promoted into, or demoted out of, the WOCU basket. Re-weightings occur on the third Thursday of May and November each year at 16:00 UTC (Universal Time, Co-Ordinated) on a logically elegant basis, by WOCU Limited, the owner and distributor of the WOCU. The WOCU real-time quotation is produced by WOCU Limited in a multiple redundancy environment to support 365 × 24 × 7 availability of the quotation with monitoring and failover functionality. The WOCU real-time quotation is available (non-exclusively) from WOCU Limited’s re-seller Interactive Data Corporation (“IDC”) via its data terminals and data feeds under the ticker symbol XCU. IDC currently calculate and offer 47 WOCU based currency pairs, and 6 commodities, as cross rates and supply a stand-alone WOCU real-time charting package application via IDC’s PrimePortal application. The high quality WOCU quotation can be very simply integrated into existing systems with the minimum of disruption and effort. From the 1st January, 2000 until 9th September, 2009 the WOCU value was calculated on a daily basis and its weightings were adjusted annually on the third Thursday of May. 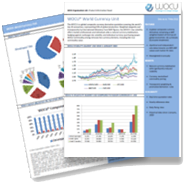 Since 10th September, 2009 the WOCU value has been calculated in real-time 24 hours per day, 7 days per week and the weightings within the basket have been adjusted biannually on the third Thursday of May and November at 16:00 UTC. To access real time data contact us here. For a quick look at historical WOCU data and charts showing how the WOCU acts as a currency shock absorber use our interactive Volatility Tool .